In an official announcement, Google declared “the wait is over” for Dutch customers eager to get their hands on a Home or Home Mini. The company only recently added support for the language to Google Assistant on phones, and now it's expanding it to its speaker. The full suite of voice commands are available, in addition to custom actions created by third-party developers, as well as smart home controls for brands such as Philips or Nest. Users can also listen to Dutch news sources. Simultaneously, a press release from Nordic Entertainment Group, the company behind the Viaplay streaming service, also notes that the Home devices will make their way to Denmark, Norway, and Sweden on October 24th. This will complete Google’s planned rollout for the year. Its Assistant only recently learned to speak Swedish in August, followed by Danish and Norwegian in September. 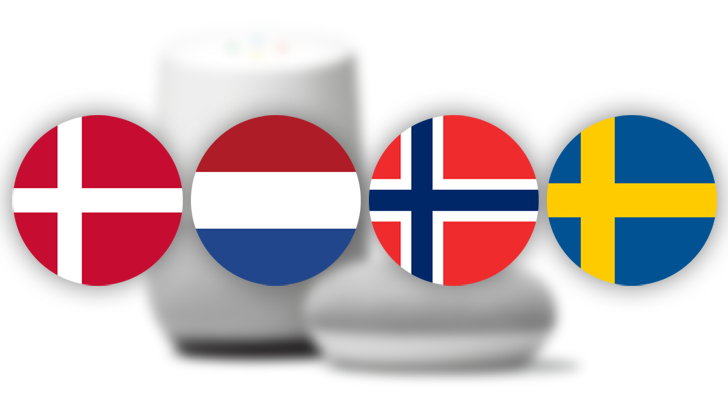 While we wait for an official announcement from the company regarding these additional countries, Danish users can set their sights on pre-ordering at Elgiganten where the products are already listed, whereas Dutch users can pre-order at Albert Heijn, Bol.com, CoolBlue, and MediaMarkt. Official pre-orders from Google may go live sooner, but in-store availability is set for October 24th. Home will retail for 149€ while its little brother will go for 59€.